Labour’s average is tracking at 35.9%: a whole percentage point higher than May. 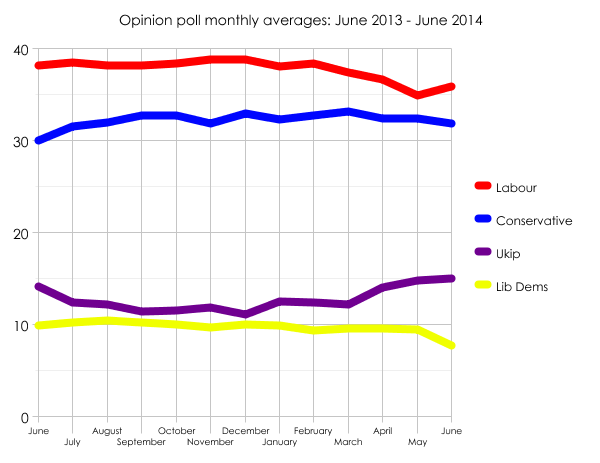 The lowest figure the party has scored in any poll so far in June has been 34%; the lowest in May was 31%. As the graph shows, Labour’s rise is being mirrored by the Lib Dems’ fall. They are now tracking at 7.7%: 1.1 percentage points lower than their average for May. Ukip’s mid-month average of 15% implies the party is not (yet) suffering from any sort of post-local election slump, as happened last summer. 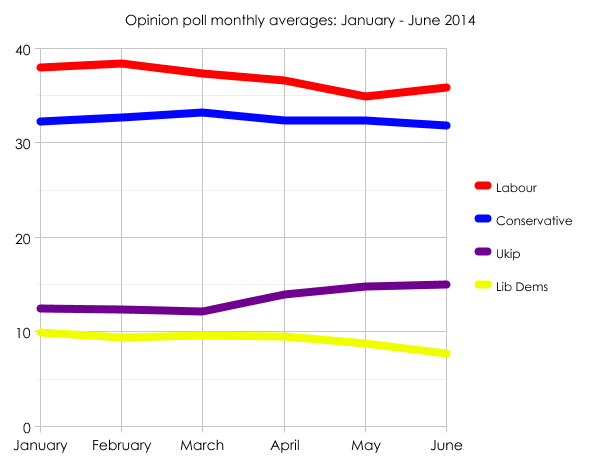 A reminder, though, that we’ve still to exceed Ukip’s all-time high of 15.9%, achieved in May 2013. Were the parties’ current poll averages reproduced at a general election, on a uniform swing Labour would end up with 347 seats: a majority of 44. The Tories would win 256 seats, the Lib Dems 21, and others 26. Ukip would not win any seats.